Protect our Social Life Sources! At the risk of boring you with the obvious, let’s review a few facts. 75 million years ago, an evil galactic ruler named Xenu deposited trillions of paralyzed alien bodies on earth and then destroyed them with H-bombs. The souls of these creatures, known as "thetans," inhabit the bodies of present day humans. The only way to mental health is to clear your consciousness of these thetans. Those are just some of the remarkable things members of the Church of Scientology believe. (Adapted from a good post on Kevin Drum’s site). Tom Cruise is gallivanting about doing himself no favors by Scientologizing to anyone who cares to listen, and many who don’t. Cruise’s dumb Scientology-based attacks on psychiatry have gotten a particularly chilly reception in the U.S.
He’s going to get an even chillier reception if he comes to Germany, where Scientology is wildly controversial. There’s a cultural difference at work here. Americans tend to view Scientology as a faintly ridiculous scam. If believing in Xenu floats your boat, and if you really want to spend thousands of dollars on unintentionally hilarious for-profit spiritual "treatments" that Scientology offers, go for it. The consensus of Germany’s mainstream media, though, is that Scientology is quite dangerous. One group called it a "criminal and totalitarian" organization, to quote an anti-Scientology letter that became the subject of a constitutional case (German) before the Federal Constitutional Court. In that case, an inaccurate accusation of membership in Scientology was affirmed as a serious invasion of the plaintiff’s honor. The German government takes the threat seriously. Here (German), is a 15-point "catalog of measures" the state of Bavaria has taken against Scientology. Among them are surveillance by the constitutional protection service, prohibition of street advertisement and "sidewalk counseling," special measures to make sure public servants who have links to Scientology aren’t diong anything suspect, and research into Scientology’s "psychological and social techniques," government-sponsored anti-Scientology propaganda "public enlightenment" measures, and government-run Scientology "crisis counseling" centers. Our society has hardly taken note of the risks that an unbridled cybernetic technologizing of our social life sources (cybersociety) might imply, especially, however of the methods of Scientific Management – in the shape of cybernetic corporate organization and control – that are applied in a part of our economic life. Scientology is an extremist representative of this trend towards increasing technologizing. Even if the Scientology organization has been under surveillance by the Office for Protection of the Constitution as an anti-constitutional movement, and even if numerous member of the organization have left it as a result of the government’s educational campaign, there can be no relaxing of vigilance. You know, I’m all in favor of people protecting our "social life sources," but I can’t help the feeling that Germany’s tax dollars could probably be better spent than by producing endless reams of such reports and employing hundreds of people to monitor the Hubbard-followers (and trust me, that’s no exaggeration). I personally don’t know what is more disquieting: this oddball religion with its iffy and coercive proselytizing, or the fact that the German state has singled it out for deep and intrusive surveillance. Whenever I see a German politician or activist warning of the terrifying dangers of Scientology, I wonder why Germans get so incredibly worked up about it. My guess is there are two possible explanations: one fairly legit, and one less so. The legit explanation is that Germany is especially sensitive to any kind of organization that seems to aspire to create a glorious new society or control the lives of its members (see: Socialism, National). That I can understand. The other explanation I propose derives from undertones you hear in many German critiques of Scientology: that it’s (1) American; (2) makes a lot of money; and (3) was founded by a guy who had absolutely no academic degrees or titles of any kind! There will be elections this coming fall in Germany, and the conservative candidate, Christian Democrat Angela Merkel, is likely to win. 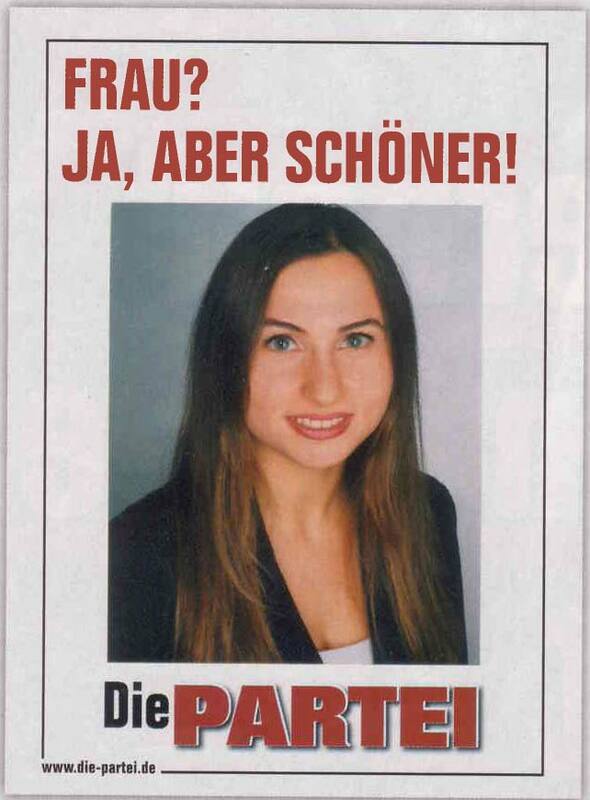 She’s a woman, she’s from the former East Germany, she’s got almost 50% support in the polls. She’s a shoo-in. But not if Titanic Magazine (German-only, until they hire me to translate them) has anything to say about it. They founded a political party (called "The Party") and recently vowed to run a "disgraceful and strictly personalized" campaign against "the Merkel," as they call her. First order of business: exploiting Merkel’s attractiveness gap. To be frank, Merkel looks a little bit like a bilious schoolmarm. The Party recently put out a "casting call" to find a hot young female candidate to run against Merkel. The entrants had to send in a photo (natch) and answer a few questions. It looks like we have a winner, to judge from the this election poster, which features the comely Yeliz Toklu under the heading "Woman? Sure, but better-looking!" Hobbies: Annoying men, getting Herpes, controlling everything, Emma. First act in office: Cancel the value-added tax on shoes! (Merkel would NEVER do that!! This alone gets 50% of the vote). Why are you better than the Merkel? I try to avoid explicit political endorsements on GJ, but let’s just say I think I know who’ll be getting the German Joys vote this fall. Beethoven’s obsession with personal hygiene got him kicked out of many apartments for splashing too much water on the floor. Yet visitors often reported a very full chamber pot located right underneath his piano. Beethoven had a colossal, one is tempted to say American-sized ego. He once told one of his royal patrons "what you have, you have by mere chance and birth. What I have, I achieved through myself. There have always been thousands of Counts and there will be thousands more. But there is only one Beethoven!" Beethoven ridiculed his brother Johann’s affectation of the title "landowner" by calling himself "brainowner." UPDATE: At one point in the early 1820s, Beethoven had promised to sell his Missa Solemnis, which he finished in 1823, to three separate publishers. He juggled them all by vague hints that he was actually composing several masses, and by pretending not to understand the terms of the original agreements. Ever heard of Jeremy Rifkin? If you’re an American, probably not, unless you read things like Utne Reader. But if you’re German or French, and you read "quality" newspapers, you can hardly escape this American activist and thinker. One of his more famous books is The End of Work, in which he predicts (to quote Publisher’s Weekly) that "worldwide unemployment will increase as new computer-based and communications technologies eliminate tens of millions of jobs in the manufacturing, agricultural and service sectors." The reason Rifkin is so popular in Europe is because he rather admires the European welfare-state model of governing. In fact, he recently wrote a book called The European Dream: How Europe’s Vision of the Future is Quietly Eclipsing the American Dream. Briefly put, Rifkin thinks the American model of wasteful consumerism, long work hours, and permanent economic insecurity for a large part of the population no longer holds much appeal for the rest of the world, which will turn to Europe for a vision of a more sustainable, cooperative way of living. The book is well-researched and intermittently convincing, but beset by a lot of long, obtuse, pshyo-historico-philosophical passages that make for tough sledding. It’s also a bit obtuse; Rifkin also seems to have spent much more time speaking to pro-Europe Europeans than to ordinary folks on the street, and therefore has a very rosy picture of the EU indeed. Well, fair enough. It did want to do all those things, and Europe is a lovely place to live because you can declare yourself in favor of all these things without other people laughing at you or dismissing you as some kind of soft-headed dreamer. He also notes that there is "barely a passing mention of free markets and trade." What he doesn’t seem to realize is that the Constitution is was primarily devoted to the progressive dismantling of trade barriers, although of course the language accomplishing these goals was rather opaque and general, to avoid frightening the voters. So, is Rifkin going back to the drawing board after this loud rejection? No! He’s plowing ahead almost as if nothing has happened, with op-ed pieces and interviews in French and German newspapers. He’s got some brand-new theory about how to shed the shackles of the manichean socialism/capitalism debate. I hate to say it, because I share many of Rifkin’s views, but wouldn’t his time be better spent not spinning new gossamer theoretical confections for implementation by European elites, but by helping those elites understand how to relate to their own populations? The author is back! First of all, many thanks to Ed Philp for his contributions over the weekend. [I have put them in a different font color, not to single Mr. Edward Philp out for discrimination, but just because that’s good blogging practice.] Now you have the perspective of two (2) "Anglo-Saxons" on life in Germany, and this blog is the richer for it. I hope Ed continues to contribute from time to time. His next-to-last post had me chuckling mordantly. Ed’s contrasting of the many "private" freedoms Germany offers (to drink beer and smoke wherever you want, or visit a prostitute) with the restrictive approach to more "public" ones (to get hired, start new businesses, accomplish bureacratic tasks) was especially apt. A visitor from the English-speaking world cannot help but be impressed by the amount of time Europeans spend structuring (often with much grace and generosity) their private affairs. After a while the visitor wonders why Europeans seem to spend so much time in "private" life. The first explanation, of course, is that they work a lot less. Don’t take my work for it, take the word of Axel Boldt’s marvelous "subjective [but quite fair] comparison" of the U.S. and Germany: "The common stereotype of the diligent hard working German and the laid back TV watching American is rather wrong. It is my experience that Americans are generally much more hard working than Germans." Aside from having a lot of free time, I think many Europeans simply do not think about trying to do anything that would bring them into contact with officials (such as starting a new company, selling homemade furniture, building a pool, etc.) because they know how time-consuming it will be. How, then, do you come to terms with it? The answer is that unless you wish to go round in a lather of impotent fury (and it must be said that this is what many foreigners do), you are best advised to shrug your shoulders and turn to the immediate pleasures of life for consolation. The Italians, you realise after a while, believe in just three things: beauty and health; family and security; and football. In the final analysis, the Italians simply cannot be bothered with the enormous problems that beset their beautiful country. They are bored by them. They don’t want to know. Now nobody would dream of comparing Italy to Germany in terms of chaos and the efficiency of the bureaucracy. Heaven forfend! But the basic idea is the same: people "turn to the private" because it’s so difficult to accomplish anything in the public sphere. Put more simply, if making a major change in your life, career, or home will force you into contact with an intrusive, demanding bureacracy that adds a great deal of meaningless effort to the change, you will stop changing. Imagine that every time you left your home, there was an official sitting there. You have to fill out a form telling him where you’re going, and he has the right to ask a few questions. He’s generally polite, and lets you do whatever you want, but he’s there all the time, and always requires you to fill out the form, and always asks you the questions. After a while, you would surely begin to go out less and less. You would balance the priorities before you left your home: is a short trip to the corner store for cigarettes worth the hassle? You would economize on the number of times you left your apartment, and try to work out ways of getting things done that didn’t require you to leave it. You would, of course, pay a lot of attention to making it as nice and cosy as possible. And perhaps that’s really what people mean when they say Europeans work to live while "Anglo-Saxons" live to work. Ed Philp here again. A very good friend of mine relayed a recent story to me of tryng to buy a goldfish in Germany: I felt it was worth it to pass this one on. For those elsewhere, Germany is extremely „tierlieb“ – kind to animals. With 20 million dogs and 8 million cats, how couldn’t it be . A sinkhole or bomb crater or something next to my office was recently fenced off and reserved for a small toad – not even an endangered species – but just a basic Mr. Schmidt toad of some common sort. This didn’t prevent the office building’s cleaning staff and caretaker from leaving a dead pidgeon outside on the building’s walkway for two weeks (picking up carrion wasn’t in their job description), but I digress. Friend: Hi, I’d like to buy two goldfish. Salesperson: OK, what sort of a tank do you have? Friend: A bowl. A nice one. Tiffany crystal. Sales: No aerator? No bubbler or oxygenator? Friend: It’s a bowl. It’s round. It has a bottom. It holds water rather well. Where are the fish? Sales: I won’t sell you a goldfish if you can’t take care of it properly. Friend: Look, I grew up near the sea. I know fish. Goldfish don’t need that. They need their water changed once a week and that’s it. Sales: I’m not selling you a fish without a bubbler. Friend: I had goldfish when I was little and they did just fine. Sales: (vengeful) Yes, and your parents replaced them in the morning when they died. And when you woke up you thought they were the same fish. Sales: I’m not selling you any fish. Friend: Do you have any cats? It’s a big bowl. The friend eventually obtained two goldfish from another store. The fish – now two months on – have done just fine in their bowl. The addition of moving, swimming color has done wonders for the apartment. Hi, it’s Edward Philp again, writing as a guest once more. Andrew’s recent political events posts have been great stuff, an excellent in-between Germany and North America perspective on the current affairs and the issues that are – and aren’t – making headlines in Germany these days. In my last post, I looked at the GEZ, the state institution responsible for collecting broadcasting fees from citizens with televisions. With this post, I want to touch on a major difference between Germany and North America, of which the GEZ is simply a reflection, namely, the difference in freedoms available to citizens. I love many of the little freedoms here in Germany. If I want to, I can drink beer at any movie theatre, or 9 am on the subway. I can smoke in my office (which I don’t share with anyone), and I can get my news from the largest newspaper in circulation, the Bild Zeitung, which proudly features a half-naked woman on its front page, usually with a clever little description of how the model happened to „lose“ her clothing (thank you Dr. Katja Kessler!). I can drive at 130 miles an hour, if I can find a highway not under construction or clogged with Dutch mobile homes heading south for vacation (stay home and look after your dikes!). I don’t really do any of those things, except for the beer in the theatres, but if I want to, I can. Granted, there are lots of little freedoms common to North America that I can’t enjoy here. I can’t buy much of anything on Sunday because of the restrictive shopping laws. I can’t pay with a credit card in most stores anymore, and I certainly can’t expect to find a cheerful and helpful sales assistant in any of those stores anyway. But these things are common in many other parts of the world as well. In contrast, I can’t start my own company here without taking a month off to complete all of the various registrations and formalities (the average is about 32 days here in Germany). I can‘t build something as simple as a table and sell it without acquiring an expensive and time-consuming carpentry license, and if I decide to go to work for a company instead, I have very limited say in where my pension contributions are invested (401 K is probably just another tax form here, instead of a means of individual decision-making). If I pull up stakes in Düsseldorf and move to Cologne to try my luck there, I have to register with the city so that the state knows where I live. And if asked by a policeman on the street for identification, I have to be able to show proof that I do live at that address. As Andrew has mentioned in his previous posts, I can’t name my child „Starshine“ or „Affentheater“ here, no matter how appropriate, and I can’t even put in an outdoor above-ground swimming pool without obtaining a building permit (complete with environmental assessment). I can’t take on a second job without having to deal with the stunned and incredulous disbelief of the local tax authorities, who will have to issue me a second Lohnsteuerkarte, or employee tax deductions certificate. I can do all of these things in Canada, the US, and in many other countries without thinking twice. I love living here, and I love the attitudes with respect to the little freedoms. I don’t drink beer on the subway or smoke in my office, but knowing that I can do things like that often makes life here very well worth living. One of my best moments here was a reception last year in Berlin at the Canadian embassy, where I smoked inside at a Canadian government event and drank beer at noon – two things that are entirely impossible in Canada (except for Quebec, where they smoke in church). But I do think that at certain points in one’s life, the larger freedoms – the ones inherent to Canada, the US, etc., eventually start to loom larger and become more definitive in respect of what makes a country truly liveable. Of course, it depends on your personality. If you like drinking beer at 9 am on the subway on the way to your smoke-filled office (where they probably won’t be able to fire you for showing up drunk, and more power to you), then Deutschland is the land of banana-flavored milk and organic non-genetically modified state-certified honey. If the larger freedoms are more important in the long run, most foreigners eventually ask themselves the question of whether the tradeoff is worth it. On a side note, speaking of headline news, in the past couple of years, German crime news keeps getting punctuated by cases of human cannibalism. The „Rottenburg Cannibal“ case made headlines two years ago, when it was discovered that a Berlin engineer had made a conscious and sober agreement with another man via an Internet chat room to be killed and eaten. The details of the story are horrifically fascinating and were trotted through the German news daily as the case went to trial (raising the intriguing issue of whether murder is committed where another person agrees to be killed). Just under a year ago, a similar case occurred in Berlin, again, set up through an Internet forum. German news this time focused on the welfare of the accused’s cat, speculating whether the cat may have been fed parts of the victim (the cat was eventually adopted by an undisclosed couple in Brandenburg). At around the same time, Germany’s Chancellor Gerhard Schröder adopted a young Russian girl – also a major news event over here. I have not heard one mention of that adopted child for months. Especially leading up to the proposed German federal election, I find this suspicious. Putting these two phenomena together, I do have to wonder whatever happened to her. Given the German Chancellor’s predilections for following media trends very closely, I would like an assurance that this young child is happy, healthy and not Borscht for the Bundesregierung. Hello, loyal joysters. As some of you know, I actually have a day job, and it will now require me to spend a lovely weekend in Bad Muenstereifel, a quaint German village and the hometown of the strangest German pop singer of them all, Heino. Have no fear, though: I have invited German Joys Associate Editor Edward Philp, whose previous contribution have amused and enlightened, to join me. Let’s hope he’s got the time and the will. In any event, I will be back at the helm on Monday. Augen zu und durch! Here’s a paper showing the amount developed nations give in foreign aid, measured as a percentage of their GDP. Four EU countries, Denmark, Luxembourg, the Netherlands, and Sweden, actually meet the United Nations-recommended target of giving .7% or more of their gross natioanl product to developing countries in the form of Official Development Assistance. Although the dollar amount the United States gives in the form of development assistance is much larger than all other countries, it still comprises only .16% of U.S. GNP. For purposes of comparison, Germany gives .28%, Japan .19%, and Canada .26%. One thing I’ve noticed, though, is that although there is a lively discussion of the politics and principles of development assistance in Germany, I hear almost no public debate about the role of the lavish subsidies developed nations pay their farmers. Mozambique is heavily dependent on its sugar industry, but loses more than £20m a year – equivalent to its entire national budget for agriculture and rural development – because of the trade distortions caused by the EU sugar scheme. The guaranteed price within the EU is three times higher than the world price of €157 per ton. Oxfam estimates the price system gives the 27 largest sugar beet farmers in the UK an average of £137,595 a year in support. Production costs of sugar cane in countries such as Mozambique are far lower than in Europe, but they are prevented from importing their products to the EU and benefiting from the higher prices by import tariffs and duties charged on their products. The import duties create a tariff equivalent to 324 per cent on sugar grown outside the EU. The EU does allow some Least Developed Countries (LDCs) such as Mozambique to import sugar to Europe without incurring the tariffs, but the quantities are severely limited. Of course, the U.S. is just as irresponsible in this area. Apparently only Sweden, among all EU countries, is ready to simply abolish export subsidies altogether. For which it was harshly criticized by the…French! UPDATE: I just switched on the TV after having a few beers with friends, and noticed that the Green environment minister of German, Renate Künast, announced to a meeting of German farmers that the government intended to follow through on a proposed 40% cut in sugar subsidies, to comply with the WTO ruling and reduce ill effects in the developing world. The crowd was not particularly pleased; it took guts for Künast to deliver this message "in the belly of the beast", so to speak. Most of the commentators on the recent EU budget summit debacle have concentrated on the debate among Western European players on the structure and purpose of Europe itself. An issue that got less play, though, was the consequences for the 10 recently-admitted EU member states, most from Eastern Europe. They were intensely interested in the discussions because they’re scheduled to start getting large subsidies for infrastructure and economic developmet in 2007. That is, if the EU can agree on a budget. The new member states, sensing impending disaster, agreed at the last moment to accept cuts in the promised payments to try to salvage a a deal. Their generosity provoked EU President Jean-Claude Juncker of Luxembourg to declare: "When I heard one after the other, all the new member countries each poorer than the other, say that in the interest of reaching an agreement they would be ready to renounce some of their financial demands, I was ashamed." In the wake of the constitutional debacle, Balint Szlanko, Brussels correspondent for this Hungarian left-liberal weekly, castigates West Europeans for their laziness. "The vile monster of favouritism has raised its ugly head in the West, its eyes lit up with xenophobia… The lazy French – and the lazy Western Europeans in general – do not feel like competing with the cheaper labour costs in Eastern Europe – or with the Eastern European economies, that can produce goods more cheaply." For Szlanko, the decisive question after the debacle is "whether the European public can accept that the EU represents the sole instrument for coping with the increasingly harsh competition in the globalised world. Only the European Union can use globalisation and harvest its fruits, while simultaneously protecting us from globalisation’s most unpleasant effects. Only transnational institutions can successfully handle transnational phenomena." Ouch! Balint, you may have a point here. But your vocabulary did Hungary no favors. You committed a terrible, terrible faux pas. There is one word that is officially banned when you’re among 6-week vacation-taking, 37.5-hour-a-week working, fourteen-official-holidays-a-year celebrating Europeans. That word is lazy. You are permitted to observe that Europeans have a "different culture of work," or a "healthier attitude toward the work-life balance," or "value having enough time to engage in ‘deep play’." You are encouraged to praise Europeans for having a "more enlightened" view of the importance of work than other cultures. But you stuck your Hungarian fingers deep into a very sensitive wound when you used that crude, accusatory, anglo-saxon word: "lazy." Next thing you know, Balint will be calling Americans "greedy." I got a thoughtful email from a reader regarding my post on the bloglessness of German politics, in which I made (gentle) fun of Germany for being old-fashioned. Saw a link to your blog and read The bloglessness of German Politics with interest. I was most drawn to your observation that Germany is backward/tradition-conscious and, having lived in SW DE for seven years, can see how you arrive at this impression. I think it is a good starting point to look at those qualities that differentiate Germany with countries like the UK and US, and which make it a fine place to be. Most remarkably, there seems to be a collective sense of naivety, held by both young and old, which conjures this impression of a late 50s (ehe early 60s?) utopia. This naivety is a great quality which is not easy to define, but which is something the US and UK have surely lost (US post-Kennedy; UK post-Thatcher perhaps). It certainly embodies many aspects of German society, ranging broadly from a positive collective consciousness on what decent work, social relationships and a good environment constitute; to an eclectic mix in which regional traditions and humours go together with an outward-looking interest in what is going on in the rest of the world. These things are certainly also to be found in the US and UK, but are not shared on such a broad basis. Doubtless the broad Wohlstand [economic well-being — ed.] achieved from the late 50s and 60s had an important role to play in allowing a common sense of consciousness of a post-war utopia (identified readily by Auslaenders [foreigners — ed.] such as ourselves). Is this also what the French for their part are trying to defend in a climate which demands rollback of the good life? Britains these days are doubtless wealthier. Less clear is how much of that wealth is the product of successful market liberalisations and how much the short term fruits of higher valuations of assets in an environment which suits capital better* . Also less clear is how wealthy people are in a non-material sense. Many Britains, having earned their crust in Brave New Britain are not happy to stay when the final Feierabend comes**. They elect to live in places such as rural France and Italy (and now Romania I hear: What rotten luck for the the gypsies). Are these people trying to finally buy a permanent piece of something many Germans already have? ** True also of Germans, but my impression is that this trend is particularly strong amongst Britains and has the heavy push factor of disliking life in Britain [these days], which is at least as important as the pull factor.